It’s January 3 and I feel like I’m no where NEAR recovered from the recent holiday season. In addition to this year being the first one I haven’t been ‘off’ (from either school or my part-time job at Buff State) at Christmas, I added six (SIX) medical appointments to take care of some varicose veins (!!!) 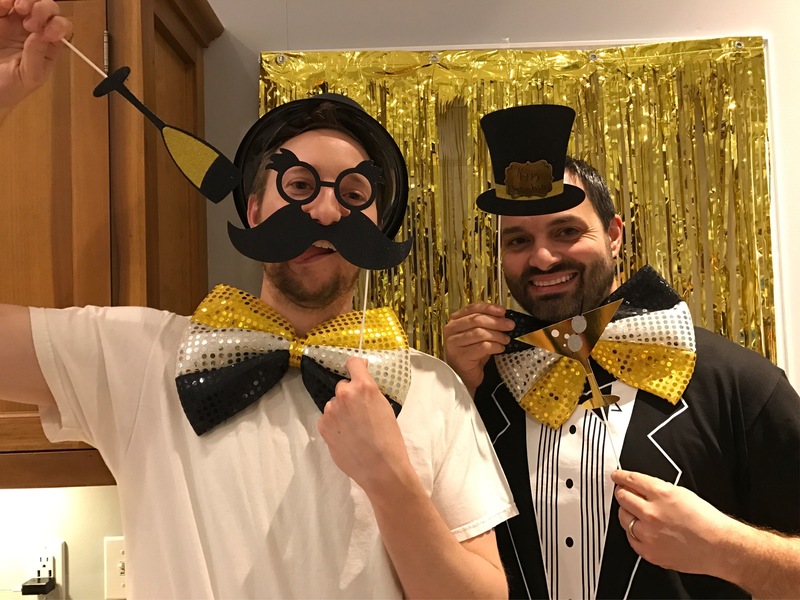 between Thanksgiving and Christmas, hosted family, weathered a pet emergency and traveled for New Year’s Eve. I’m exhausted just remembering all that I did. I cut down my first tree! We ( as in, the entire Layer clan) usually go cut down our Christmas tree the weekend after Thanksgiving, and we didn’t let Andrew’s absence (due to a meeting) stop us. Man, does it take some elbow grease to handle that saw. A couple weeks later, I ran in–and placed in my age group–in the Caroler 5K. I’ve missed signing up for this race EVERY YEAR since moving here. Inevitably, I’m driving to the gym on a Saturday in mid-December only to see crews setting up road blocks…and I realize I’ve missed it, AGAIN. This year, the race fell on our our anniversary and the day of our Carolcade on Main Street, so I made it a point to sign up. I squeaked into third since the overall female winner was in my age group, and enjoyed running with and seeing my friends from our local running group (note our psychedelic jackets) afterward. Later that night, Andrew and I went to our favorite place, Rick’s on Main, to celebrate our 11th (!!!) wedding anniversary. We sat at the little table on the balcony, exchanged cards and sipped wine. We can’t believe that many years have gone by already. Warning! The next photo is not for those with a weak stomach! Earlier this fall, I decided to get my legs looked at after beginning to notice some unsightly veins popping up… Varicose veins are hereditary and the Rosene family has more than enough to go around. Who knew 33 would be old enough to begin treatment?! 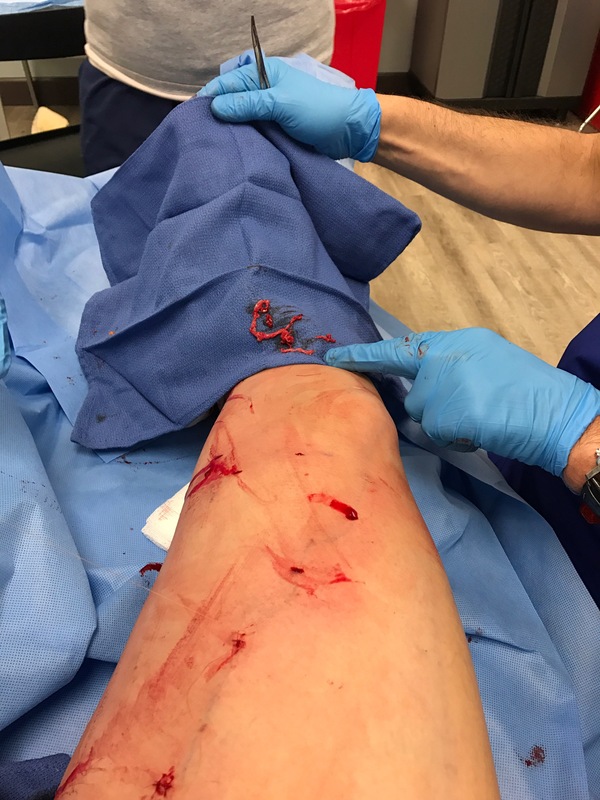 I had three procedures in all, the first two simply involved a laser and the closing of vein connections; the last procedure included actually removing the vein (but is not the same as vein ‘stripping’). It looks/looked much worse than it actually was–a couple puncture wounds continued to bleed and my leg bruised pretty badly–and there was minimal pain. I’m almost fully recovered, don’t have any physical limitations and am looking forward to NOT seeing that big, blue vein anytime soon. I’m trying to remember to wear my compression stockings (thigh-highs!) to work and am thankful they’ve come a long way since my dad had his veins done and had to wear super tight, super thick beige ones. Gross. Just three days later, Christmas was upon us. The Rosenes (mom, dad, Aaron and Josh) visited for the holiday and brought the total attendees for our annual Christmas Eve party to a whopping 17 people. It was a ‘plastic plates, silverware and eat anywhere you can find a seat’ kind of event! Joshua entertained us all with card tricks, the parents gathered in clumps to chat and a couple of us youngsters spiked our egg nog. We ended the night traditionally, by reading the birth of Jesus in the book of Luke and our nephew, Blake, helped us blow out the candles on Jesus’ birthday cake. After opening gifts at the house Christmas morning, my family joined the Layers at their house for a meal. The next morning, Andrew and I took Joshua to the airport so he could visit his girlfriend in Florida and the rest of my family left after lunch in two cars–the one they brought and our green Silverado. The great Layer family car ‘domino affect’ of 2016, (which started with grandma’s new car purchase this summer) is now complete and six (!!!) individuals are now driving new and/or new-to-them cars. Andrew recently purchased his dad’s old truck and looks forward to installing his Christmas present from me, a new Bluetooth-ready car stereo, as soon as he can. We spent Monday after Christmas enjoying time with Abigail, Marvin and grandma before their scheduled departures the next day. On Tuesday, as I was about to leave for work in the morning, I noticed vomit on the floor and Hadrian didn’t look right. I woke Andrew up and told him to get Hadrian to the vet as soon as possible; I didn’t know what was up and it’s not like he’s never been sick on the floor before, but I just had a feeling. I left for work praying it was nothing–perhaps an infection–but received the worst of all news from Andrew as I was pulling into the parking lot: it was bloat (gastric dilation volvulus) and we needed to make a decision, and fast. 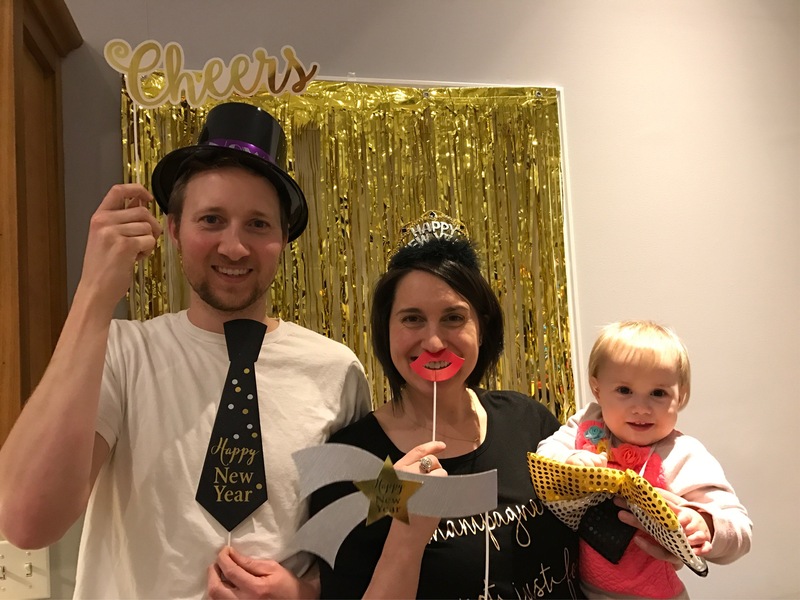 We chose a middle of the road option–conservative treatment that involves placing a tube and hoping the stomach will right itself as the pressure is relieved–as we couldn’t justify the enormous expense of surgery. I was mess and immediately turned around to come home, expecting to say goodbye to our beloved dog. Miraculously, the tube worked, surgery wasn’t necessary and Hadrian’s vitals returned to normal. He stayed overnight for observation and we were able to visit him twice before bringing him home the next day. Andrew and I spent the morning at the Layers, afraid to be home in our empty house, nervous that our dog wouldn’t make it through this ordeal; GDV is completely fatal if untreated and can cause heart attack, organ damage and is likely to recur. He’s home now and we’re making changes to his routine to help prevent bloat from happening again; unfortunately, many of his normal habits (such as drinking and eating a lot at once, drinking out of the kitchen sink) are risk factors. As a large-dog owner, I knew this condition was possible and could be brought on by physical exertion after eating; I had no idea it could happen spontaneous overnight. We’re feeding him less food more frequently throughout the day, nixing the sink-drinking (finally! I’ve never liked that Andrew allowed him to do that) and changing his food to a higher-quality, higher protein mix that doesn’t promote as much fermentation (a.k.a. gas in the stomach) as one high in carbohydrate (hmm…that sounds familiar from school). We’re also considering a surgical procedure that will help prevent this from happening again, too. I may complain A LOT about the hair in my house, but I was not ready to say goodbye to sweet Hadrian. He’s seven, but a young seven, in my opinion, and I hope we have many more years with him. Needless to say, he’s being spoiled rotten by both of us. While all this dog drama was happening, I got my first TPN (total parenteral nutrition) patient in the hospital! While not uncommon in larger hospitals, TPN isn’t something we see often at DeGraff, which is very small. TPN is perhaps the most complicated thing a dietitian will ever do, and it’s important for me to get experience with it. TPN is nutrition completely broken down and directed into the bloodstream, so it’s not digested at all. Think of it as the building blocks of what we eat normally, i.e. protein is in the form of amino acids. Basically, it’s one long set of calculations based on a patient’s individual needs, and then more calculations to make sure it’s not too taxing to their system and then MORE calculations to make sure the proportions of amino acids, dextrose (carbs) and lipids (fat) will stay in solution. Then, (as if there wasn’t enough to do already) you look at the person’s lab values to gauge how much electrolytes and which kinds to include. This is a daily procedure and must be reviewed each day and signed off by the doctor and nurse. I’ve really enjoyed working with the TPN and can see myself doing more of this–called ‘nutrition support’–in the future. The following weekend, with Hadrian safely ensconced at the Layers’ house, Andrew and I met our best friends, Emily, Dan and their sweet daughter, Nora, in Cleveland for New Year’s Eve. On the way into town, Andrew and I stopped at house used in filming the old classic, The Christmas Story. We were too late for a tour (Emily said the best part was the outside, anyway, as the inside is only a replica) but hit the gift shop for a souvenir ornament of–what else?–a leg lamp. For the last few years, the four of us (now five!) have spent the holiday together and we intend to keep it that way. Meeting in Cleveland proved to be a great option, as our drive was only about 3 hours and very do-able; it’s exactly halfway and I hope to meet Emily there for future visits. 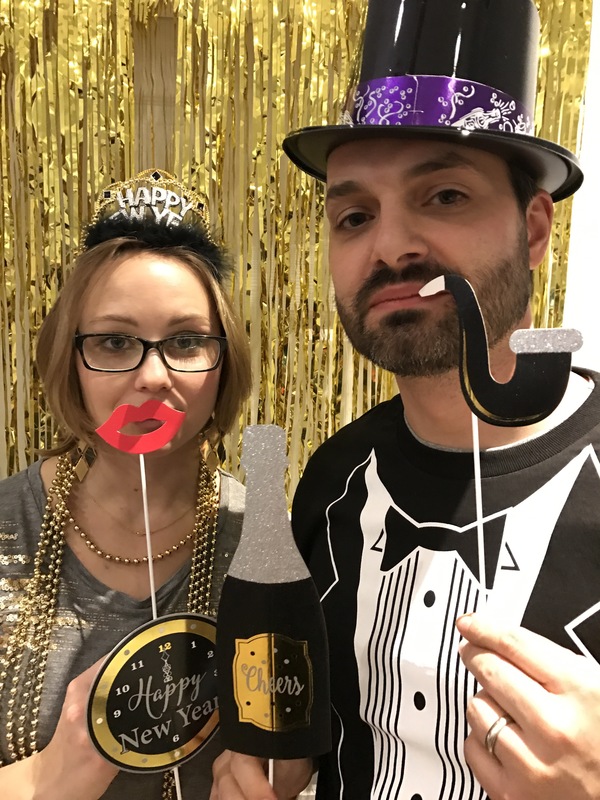 She and I planned a comfy-yet-stylish evening, complete with gold slippers, sequin tops and a well-equipped selfie station with props. We rented a small condo for the night, brought in all our food, ordered pizza and watched movies until the ball dropped (which we missed by about a minute). 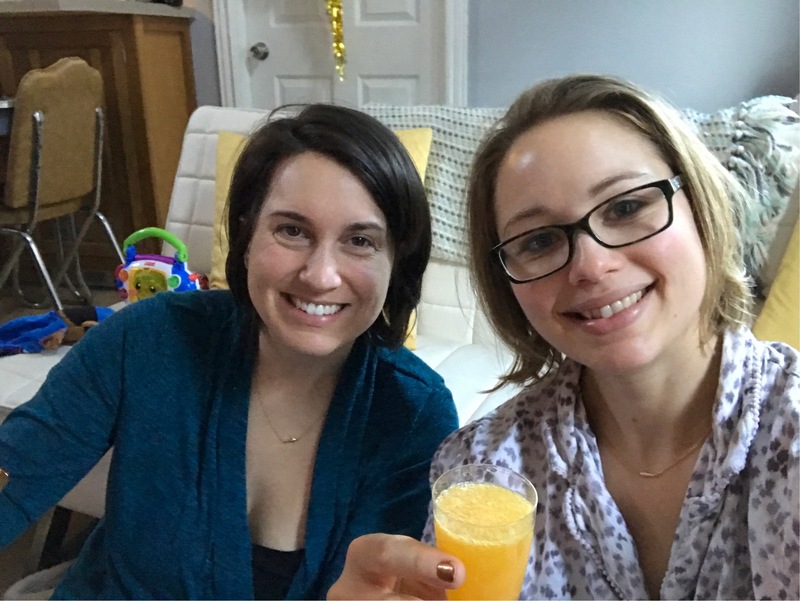 The next morning, we all lounged around in jammies, sipped mimosas and watched Nora play with her grocery cart and farmer’s market veggie bushels, gifts from Andrew and me. 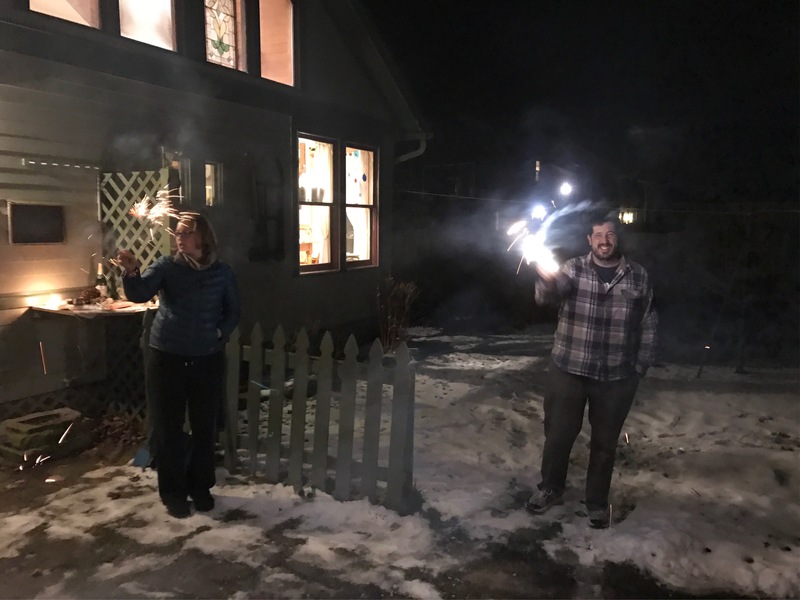 After returning home on the 1st, Andrew and I joined the Nyes at their house and ended up lighting sparklers to ring in the new year. And, despite Mr. Nye’s protestations, some fireworks. Posted on January 2, 2017 January 3, 2017 by thehealthypineapplePosted in Slice of Life, TravelTagged bloat, caroler 5k, christmas, Cleveland, degraff memorial hospital, fireworks, GDV, hadrian, New Year's Eve, Rick's on Main, The Christmas Story, The Christmas Story house, TPN, varicose veins, veins veins veins.